Page revised in October 2009. Monte Citorio (today Montecitorio) was the name given to a small man-made mound originating from the levelling of the nearby area where Emperor Augustus built Horologium Divi Augusti, a gigantic sundial. Mons Acceptorius (mountain fit for receiving) is thought to be the source of the current name, although others believe it derives from Mons Citatorius, because of the citations (orders to appear in a law court) which were hung on the pedestal of Colonna di Antonino Pio. 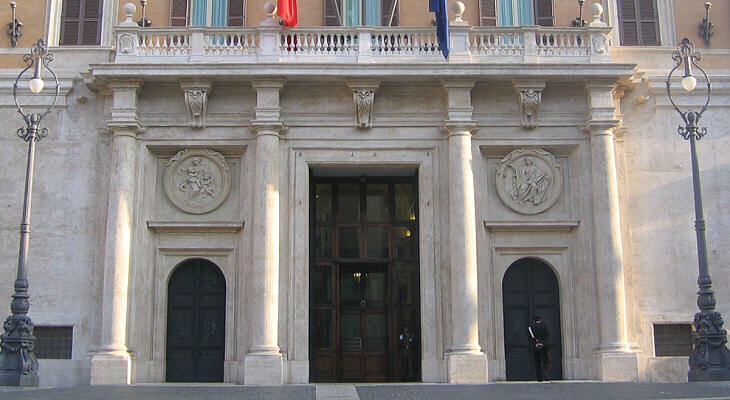 Vasi calls the palace Curia Innocenziana because it was completed by Pope Innocent XII to house several tribunals and the police headquarters. 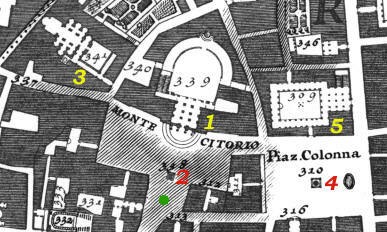 The view is taken from the square in front of the palace (green circle in the 1748 map below). 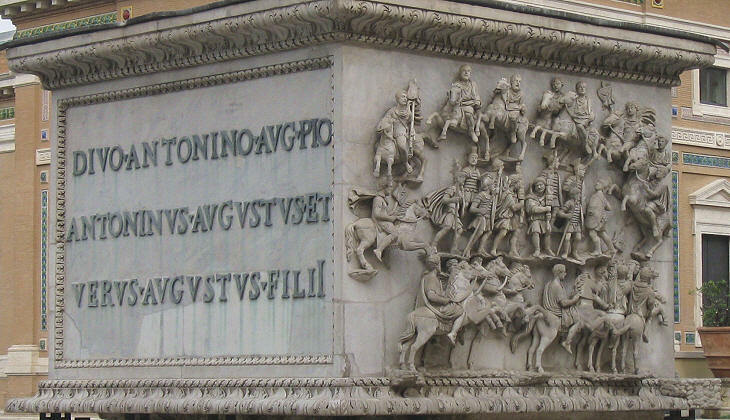 In the description below the plate Vasi made reference to: 1) Curia Innocenziana; 2) the pedestal of Colonna di Antonino Pio; 3) Casa dei Signori della Missione; 4) Colonna Antonina; 5) Palazzo Chigi. 3), 4), and 5) are covered in other pages. The façade of the palace is untouched although its interior was widely modified after 1871 to adapt it to the needs of Camera dei Deputati, the Lower House of the Italian Parliament. The pedestal of a column erected in honour of Emperor Antoninus Pius and his wife Annia Faustina was replaced in 1789 by the obelisk which served as the sundial in Horologium Divi Augusti. 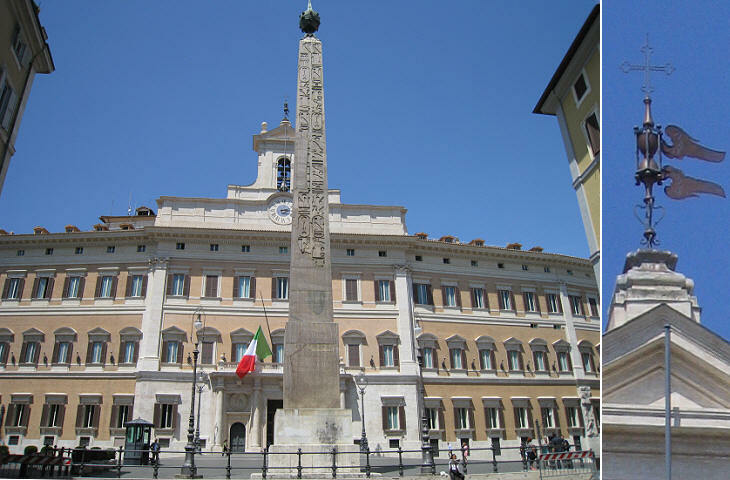 The obelisk (broken and lacking some parts) was found in 1748 and during the pontificate of Pope Pius VI it was restored and placed in Piazza di Montecitorio. Palazzo di Montecitorio was designed by Gian Lorenzo Bernini in 1653 for Prince Niccolò Ludovisi and his wife Costanza Pamphilj di San Martino; the former was a nephew of Pope Gregory XV and the latter the niece of Pope Innocent X, the reigning pope. Because of the slope of the ground Bernini designed a convex façade; in the decoration of the smaller side wings he made use of fake rocks, as he had done in Fontana dei Quattro Fiumi. The original design provided for a different portal and a balcony supported by telamones (see my illustrated glossary of art terms). The construction of the palace was not completed owing to the death of Prince Ludovisi. The unfinished building was acquired by Pope Innocent XII who asked Carlo Fontana to complete it and to adapt it to house public offices. The entrance and the balcony were given a more severe appearance and they were decorated with reliefs portraying Charity (left) and Justice (right). 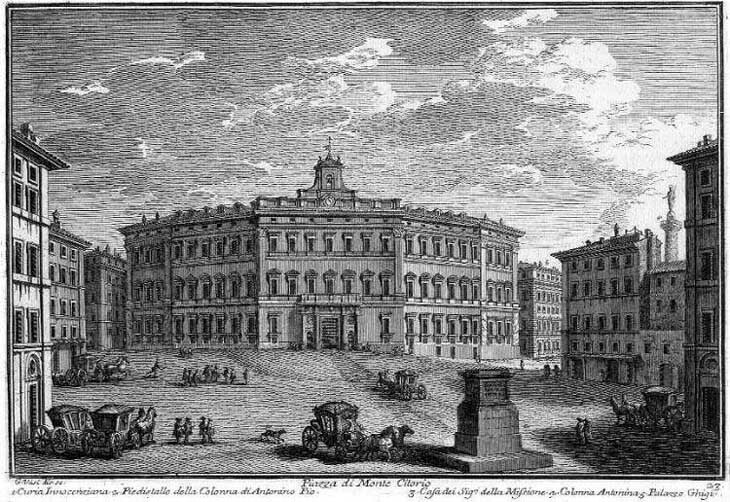 Starting in 1743 crowds gathered every two weeks in Piazza di Montecitorio to attend the lottery draw which took place on the balcony of the palace. 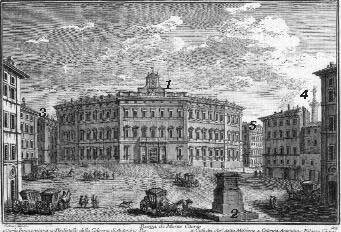 The small 1748 map at the top of the page shows that Palazzo di Montecitorio had a very large courtyard which does not exist any longer; a lengthy inscription which celebrated the completion of the building and a coat of arms of the pope have ended in an open air warehouse at the foot of the Aventine hill. 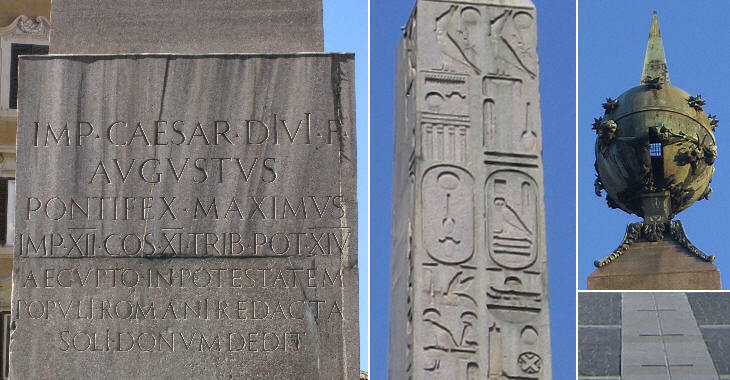 The obelisk erected by Pharaoh Psammetichus II (595-589 BC) in Heliopolis was brought to Rome by Emperor Augustus and used as the gnomon of a sundial (to see all the obelisks of Rome click here). The inscription celebrates the conquest of Egypt: IMP(erator) CAESAR DIVI F(ilius) AUGUSTUS PONTIFEX MAXIMUS IMP(erator) XII (for the twelfth time) CO(n)S(ul) XI (for the eleventh time) TRIB(unus) POT(estatis) XIV (for the fourteenth time) A EGYPTO IN POTESTATEM POPULI ROMANI REDACTA SOLI DONUM DEDIT (Augustus, son of godly emperor Caesar, while he was pontifex maximus, consul and tribune brought -this obelix- from Egypt -a land- he had placed under the power of the Roman People. He dedicated this gift -the obelisk- to the Sun). Pope Pius VI decided to retain the original use of the obelisk and the bronze globe he placed at the top of the monument is pierced so that at noon a sun ray crosses it and indicates the date on a series of markers on the pavement of the square. The globe is decorated by the heraldic symbols of the pope, which included the representation of a blowing wind. The relief at the base of the column was moved to the Vatican Museums. For many years it was in the Niche of the Fir Cone, now it is near the entrance. 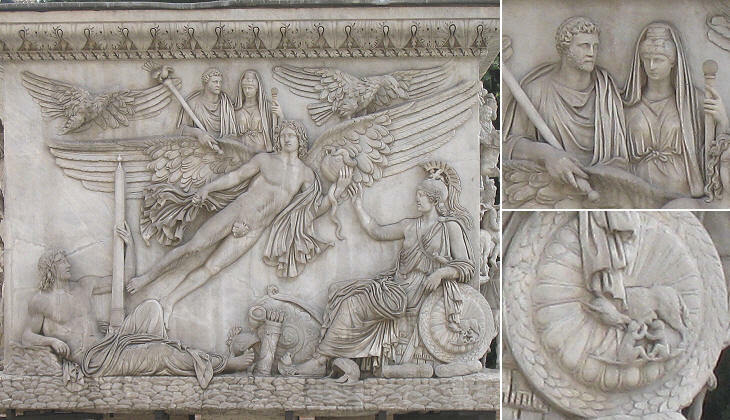 The relief shows Thanatos, a personification of Death, leading to heaven the Emperor and his wife Annia Faustina. For the Greeks Thanatos was a daemon and he was represented as an old man, but at the time of Emperor Antoninus Pius, the transition to death was regarded in a less dramatic way and in many sarcophagi Thanatos was represented as a beautiful winged boy. Curia Innocenziana sul Monte Citorio Questo piccolo monte prese il nome di citorio, o citatorio dal citare le Centurie, che anticamente qui nel Campo Marzio si convocavano, affinchè entrassero ne' septi, che quivi presso erano, per dare ivi i loro voti nell'elezione de' Magistrati. Or quivi essendo un grande edifizio principiato nel Pontificato d'Innocenzo X. con disegno del Cavalier Bernini, il Pontefice Innocenzo XII. colla direzione del Cavalier Francesco Fontana vi eresse la Curia Romana, che dal suo nome dicesi Innocenziana. Risiedono in questa il Tesoriere, e l'Auditore della Reverenda Camera Apostolica, con altri Giudici, e Ministri, e vi sono ancora gli ufizj de' Notari, ed il banco de' Cursori, onde vi si agitano le cause più importanti, e rimarchevoli. Il Piedistallo, che si vede alzato dinanzi a questa Curia fu disotterrato l'anno 1705., ove è ora la casa de' Preti della Missione, insieme colla colonna di granito egizio, che ora sta a giacere al lato destro della Curia. Il Pontefice Clemente XI. allora regnante pensava di alzarla come stava anticamente: ma trovata la colonna rotta in più luoghi, fu lasciata l'opera imperfetta; Benedetto XIV. però volendo mettere al pubblico un monumento sì insigne della Romana antichità inalzò solamente il piedistallo con idea di porvi sopra una statua di marmo: ma nemmeno ciò ebbe effetto. La iscrizione, che vi si vede fatta simile all'antica con lettere di metallo, c'insegna, che la colonna fu dedicata ad Antonino Pio, e li bassirilievi delle tre facciate ci dimostrano l’Apoteosi fatta al medesimo Imperatore.